The 120 Right Hand Studies by Mauro Giuliani really are fantastic. As a whole they cover about every permutation in the right hand that you might find in Giuliani, and a number of other genres. They are structured, systematic, and comprehensive, which I like a lot. In a similar way to scales, you can use each of these little studies as a tool to develop an aspect of your technique. The first study is a deceptive one. Being the first of many I guess you might think it is going to be the most basic. 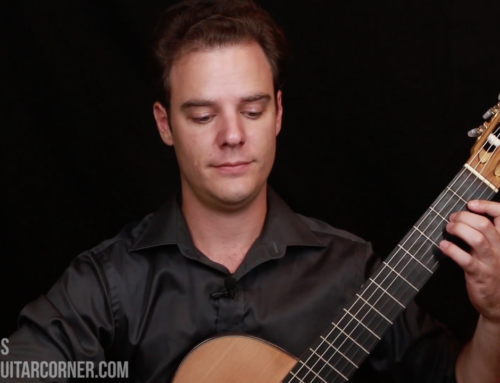 Indeed, it does look basic, however, the first of Giuliani’s studies actually taps into one of the more sophisticated aspects of the classical guitar. Voicing. The first study has the thumb and two other fingers working together to play a single chord. The difficulty in this seemingly simple study is that you need to be able to control the sound and volume of each voice. Each digit on our right hand is different, and each nail is unique. Given this variation we have to learn how to make a sound with each finger that is controlled, consistent and will match the other fingers being played, both in dynamics and tone. Play all notes at exactly the same time. It is often tempting to break the notes apart, just a little, in fact our hands are very good at making this effect. It is often called “rolling” a chord or playing a “broken” chord. This effect can eventually get a bit dated, so it is important to practice playing the notes together. Play through the study three times (with the repeats) and each time bring out (play louder) a different voice. On the first run bring out the top notes. On the second run bring out the bass, and finally bring out the inner voice. This is challenging! Sound – both quality and consistency. I know that sounds good, but could it be better? Consistency – Getting one note sounding good isn’t enough, make sure you can control all the notes all of the time. Balance – Like I was saying try an get your right hand fingers to have controlled dynamics. If one finger is especially loud or soft, see if you can bring it into line. General Right Hand position – Remember this lesson on the right hand? Every now and then check in to see that you are maintaining a good position. If you would like to study the 120 Right Hand Studies in more detail, you can take the Level 1 Technique & Musicianship Video Course in our membership packages! In this course I talk about how to practice the studies and give demonstrations with the right hand.